The parsley plant has a reputation for being hard to germinate from seed. There's tales of it having to go to the devil and back 3 times or it only germinates in households where the woman's in charge or you need to pour boiling water on the soil before you sow the seed! Which do you want to believe? Parsley does take about 21 days to germinate - which is a lot longer than other herbs we use. 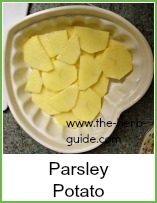 To understand this, you need to realise that parsley is a biennial plant. That means that it germinates and puts down a root system in year 1 and in year 2, it flowers and seeds. We like to use the year 1 leaves in cooking and don't need the year 2 plant. 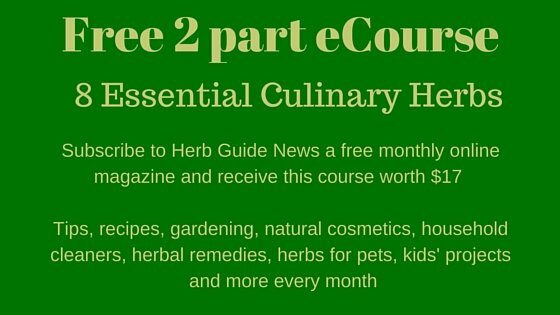 1 Parsley takes up to 21 days to germinate whatever rituals you decide to perform. 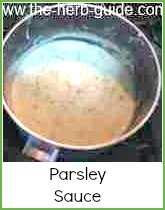 2 The parsley plant which we use for culinary purposes is the year 1 growth of a biennial plant. 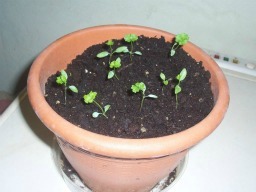 The parsley picture here is of some seedlings I grew indoors - this was taken 21 days after sowing - maybe the woman's in charge in our house or perhaps we have a direct line to the devil?? The simple guidelines are this. Take a plant pot and fill it with good quality compost - water well and allow it to drain - at least a couple of hours. Parsley seeds are very small - a typical packet will contain 1000 - although how they count them I don't know! The packet will tell you to 'sow thinly'. All well and good, but unless you have a very steady hand, you will end up with 100 seedlings in a small area - they'll become crowded and none of them will make a good parsley plant. What I do, is this. First of all, I ensure my pot is prepared and ready to take the seeds - instructions above - leave a couple of hours - that's important. Then I make sure my hands are really dry. I then tip out a few seeds into the palm of one hand - I'm right handed, so they go in my left palm. You can see the seeds - they're not very fine - just small. 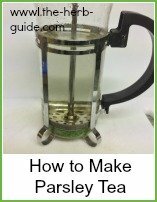 I take a dampened cocktail stick or skewer and dab it onto an individual seed. Then place it into the compost and 'rub' it into the soil. I do this about 10 times - spacing the seeds carefully around the pot and tip the excess seeds from my 'dry' hand back into the packet. Note - if the seeds have got wet, then don't put them back - just discard them - there are hundreds more!! The seeds will have been planted and within a week or so you will see signs of growth. The seedlings emerge and within 3 weeks you will see the definite parsley shaped leaves as in the picture above. I like to use a spray of cheshunt compound to keep damping off and diseases at bay - I will do this daily after the first leaves emerge. When the seedlings have their first true leaves, this is the time to pot them on. If you transplant them outdoors, then slugs will get them at this point as they're very tender, so I plant the seedlings on into larger pots indoors prior to planting out in the herb garden. If you put your excess seeds in a tupperware container, you can keep them in the fridge. If you get to a year where they don't germinate, then buy a new packet - I've had parsley seed for 6 years and still had good germination. The parsley plant is an essential in any herb garden.